When you think of a ceiling fan, you’re not thinking of something as high-tech or as powerful as a dedicated air conditioning system. And we’re not going to try and tell you that a ceiling fan makes a great substitute for an air conditioner—you simply can’t compare the two. 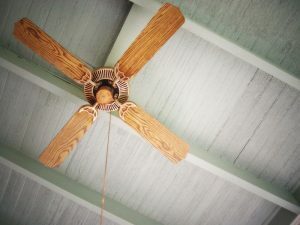 As stated above, a mistake that many people make with their ceiling fan is thinking that it’s a substitute for air conditioning and not a supplement to it. By assuming that the ceiling fan is supposed to do the same job as an air conditioner, they’re missing out on some savings in both summer and in winter. It turns out, your ceiling fan can be used to supplement your HVAC system in any season. In fact, it can help raise or lower the temperature in the room by four to five degrees. Allowing the fan to rotate clockwise in winter helps pull up cool air better distribute warm air through the room. Rotating it counter-clockwise in the summer does the opposite and helps you stay cooler. We don’t mean using your air conditioner when you don’t feel like spending the money on air conditioning. Instead, we mean a “backup” in the sense of an emergency. Several ceiling fans also have backup battery options, allowing you to run your fan even during the middle of a power outage. When there’s nothing that can be done to power on your AC during these times, the battery-powered ceiling fan will be a lifesaver. Not every ceiling fan has this option, however, so you’ll want to consult with an electrician in Frisco, Texas before committing to a particular model. Inside your home, nothing beats the cooling power of an HVAC system. Outside of the home, however, an air conditioner is nearly powerless—they work solely on their ability to cool a contained, closed-off space. But this isn’t the case with a ceiling fan. Their strength is their ability to cool your body with the wind-chill effect, much like a cool summer breeze. Naturally, that means it’s a perfect fit for use outdoors. A ceiling fan is an ideal solution if you need to cool down a space like a patio, a deck, or a front or back porch. Lunch and dinner on the backyard dining table is a popular summertime occasion that you shouldn’t let be ruined by a bit of excess heat. Plus, the wind from the ceiling fan is enough to help ward off annoying pests like bugs and mosquitos. If you’re thinking of installing a ceiling fan for this spring and summer, contact Hutchins Plumbing & Air Conditioning today.